Netflix offers tutorials to make socks that will turn off your TV when you fall asleep. A little knitting, a little soldering, and you’re golden. Looking for a last minute DIY gift idea? Interested in knitting and/or Arduinos and want to kick your skills up a notch? 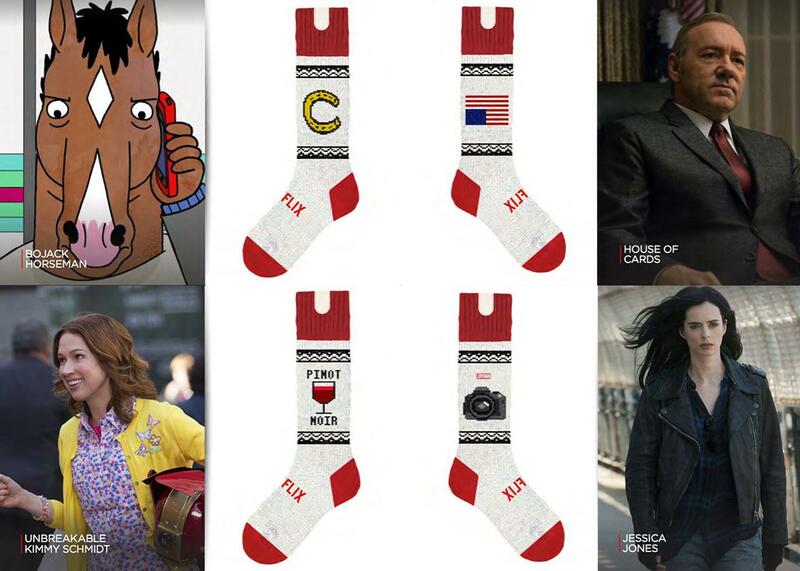 Look no further than Netflix’s new “Make It” project: Netflix Socks! These custom knit socks use an accelerometer, an Arduino microcontroller, and an infrared light-emitting diode to send a signal that will pause or stop your show or turn off your television when you fall asleep. While these socks may seem like a far-fetched gimmick, they are a fantastic way to bring attention to projects that blend technology with crafting, which can be often be dismissed as a low-tech hobby. For the craft side, Netflix provides free sock patterns based on its original programming, including pinot noir socks for Unbreakable Kimmy Schmidt and camera socks for Jessica Jones. If none of these shows is your (or your intended recipient’s) taste, you can head on over to other online pattern repositories such as Ravelry or to crafting blogs to find additional knit (or crochet) sock patterns, including some Tardis socks for the Whovian in your life. You could just purchase a pair of socks to use as a base, but you’ll still have to do some sewing—some stitching is integral to this project. On the electronics side, Netflix provides a parts list, wiring schematic, and initial code for components. The project might not be great for the beginners: You’ll need to adjust code, layout, wiring, and the infrared signal (the same signal your remote control uses) to your own television and socks. However, Netflix provides links to important concepts throughout the tutorial to allow those at different levels of electronics proficiency to attempt this project. Netflix Socks also offers a gateway to wider-ranging Maker/DIY sites. Want to upgrade your socks with a pulse sensor or make sure that television can receive your IR signal when you are in your most comfortable position? Netflix provides links that will send you to parts supplier Sparkfun as well as to tutorial sites like Instructables and the Adafruit Learning System. Links in the sock patterns send users to knitting tutorials at Purl Soho and on knitting blogs. By including these links, Netflix highlights the technological acceptance, sharing nature, and resource availability valued by both the crafting and the tech DIY communities. To promote the sharing nature of these communities even further, the Make It site features a “Share Your Idea” form. I, for one, am hoping this yields a solution for those of us who only watch Netflix on our laptops! Netflix has created an impressively inclusive project by avoiding gendering craft or technology and by avoiding placing more value on either aspect of this project. It’s a shrewd PR move—but Netflix should still be applauded for creating such a well-balanced tutorial for its user base (which boasts “69 million members in over 60 countries”). The inclusivity and blend of craft and technology in these tutorials can bring those on either side of the spectrum together and provide resources for deeper learning. These socks are the second Make It project; its first foray was the Switch, which also uses IR-signal components housed in an individualized casing and “turns on your TV and brings you right to Netflix, dims your lights, silences your phone, and even orders you food.” Based on these first two offerings, I am excited to see how Netflix approaches technology and craft in their next project. So if you’ve still got some people on your list, pour yourself a glass of eggnog, start that Gilmore Girls knit-a-thon episode, and carve out some quality Netflix, knit, and circuit-construction time.